So, I don't really know how growing stuff works, other than that you put seeds in dirt, water it, and it works maybe 50% of the time. Apparently my cucumbers decided to do really well this year. We've been getting a harvest like this every couple of days. 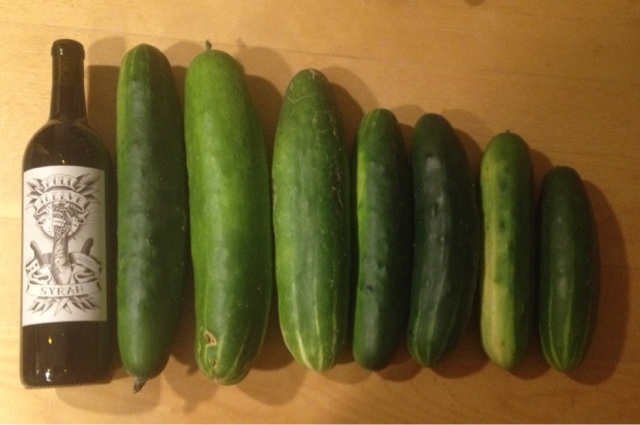 If you live on my street and wonder why there were cucumbers in your mailbox, you're welcome. Of course they had to go and do a lot better than the more versatile things we planted (squashes, tomatoes, onions, sweet potatoes, okra, collards...). Not that I'm complaining, but I have a feeling I'm going to end up spending more to buy things to use up the cucumbers than I saved by growing food myself. My free wine is here!